1. Automatically recording everything from Windows Live Messenger including the rich text message with font and colors, the emotion icons, the new Winks graphic, the hand writing inks, the sent and received files, the online status of your contact, and all the activities like audio/video invitations. 2. Workinging in an absolutely hiding mode: After installing and making your personal setting at the first time you use, you do not need to run its main program when you chat or when you wanna track other's chat. It will start to work as long as the Windows Live Messenger is opened -- like a spy! 3. Suitable for parent controls: Concerned parents can use it to track your kidsâ€™ activities on MSN messenger and protect them from potential troubles. 4. Security: with an advanced encrypt method, accessing and setting are all password protected. 5. 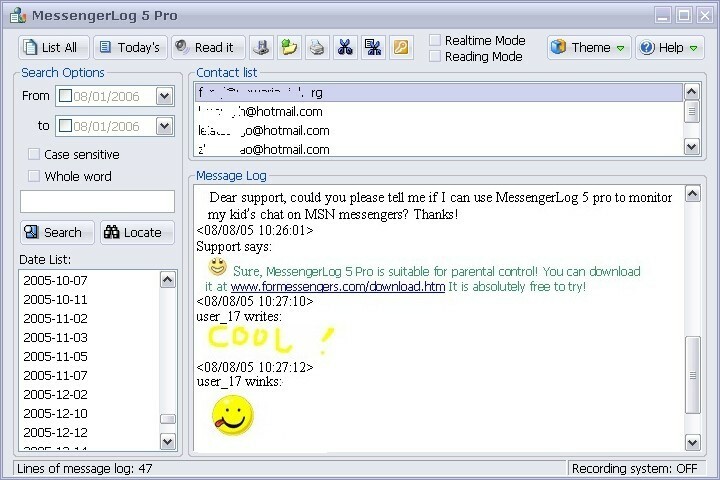 Log saving: The log is saved as the same format as you see in your MSN messenger. 6. Log searching: The log is classified by date. With our strong search engine, you can easily and accurately find the logs you want. 7. Log editing directly in MessengerLog.